Have you ever laid down at the end of the day and realized that the only thing you have accomplished for the day is evaluating which of the videos of kittens playing with a ball was the cutest? There is a fine line between updating you Facebook status and spending the entire day chatting online with that friend from school you didn't even like. This New Year, get over all your distractions! 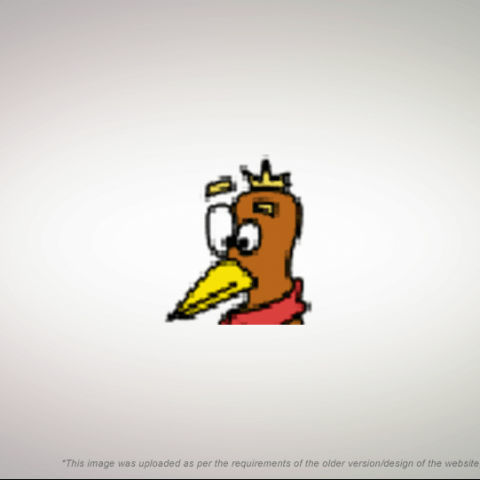 If you are your own task-master, it's often a good idea to place restrictions on yourself, so you can actually get some work done; and Cold Turkey is a free and open source software that helps you with that. 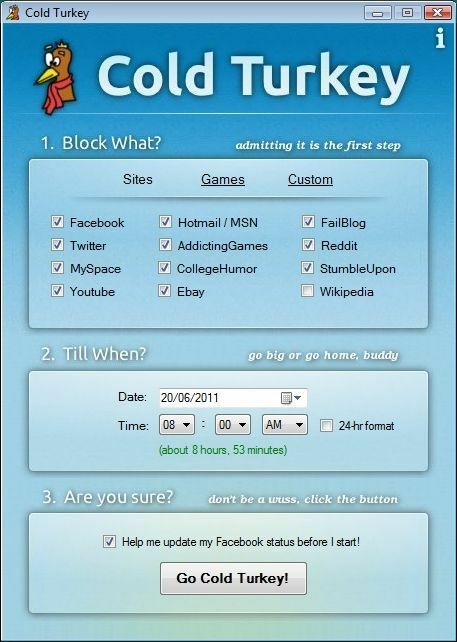 Cold Turkey is a simple application that is designed to block distracting websites for a specified duration so you can focus on your work. The application has a simple interface, you select which sites you wish to block, specify the date and time till when the websites need to be blocked, and it will do the rest. Out of the box it supports a number of popular sources of distraction; Facebook, Twitter, MySpace, Youtube, Hotmail/MSN, Wikipedia, Ebay, CollegeHumor, AddictingGames, Reddit, FailBlog, StumbleUpon, and Warcraft III are supported by default, and you can enter a list of additional websites to block. Based on the kind of work you do, some of them -- such as Wikipedia -- might actually be useful though; no worries, you can pick which ones to block. What's especially brilliant about Cold Turkey is that it's merciless! Once you have asked it to block websites, it cannot be stopped, you simply can't go back on your decision and change you mind. Restarting the computer won't help and it will continue blocking the sites. It cannot easily be stopped from the task manager, and it cannot even be uninstalled! It even uses time from a remote server so you cannot change your system date and get by. Using the same tricks antivirus applications use to protect themselves, Cold Turkey can persevere despite your best attempts. The whole point of the application is to protect you from your own tendencies, and changing your mind isn't good enough. If you trusted yourself, you wouldn't need the program in the first place, would you? Cold Turkey in fact goes a step further and blocks you for an entire week, if you even try to mess with its security! Cold Turkey is a small download of under an MB, and has a clean single-dialog interface. You can download it from here. Use it with caution though.